Paint estimating can be tricky. Most manufactures do not carry ready mixed colors. This means you have to choose the color you want and have it mixed for you. The paint cannot be returned after you purchase it in most cases. You don’t need to have a lot of paint left over, but you do want at least a quart left for touch-ups. Accidents do happen and a little extra paint can save the expense of repainting an entire room. To calculate the square footage of the area to be painted, multiply the width of the wall by its height. For the ceiling, just measure the length of the longest wall and the shortest wall. Multiply the two measurements. If you measure in inches, divide by 144. If you measure in feet, then divide by 12. This gives you total square feet for the area. If you have more than one wall or ceiling to paint, calculate the square footage of each wall. Then total the separate calculations according to the color scheme you have chosen. Don’t panic if the room you’re painting isn’t perfectly rectangular; you can either break the space up into rectangular sections, calculate the square footage of each, then add the measurements together, or simply multiply the longest stretch of ceiling by the widest (you may end up with a lot of extra paint, depending on the shape of your room). You will need one gallon of primer or paint to cover 250 square feet of wall. This estimate works best for acrylic primers and paints, and takes into account different application methods and rougher surface textures. Generally, the rougher a surface is the more primer or paint it will take. For smooth sealed walls, one gallon for each 300 to 350 square feet will often be adequate. It never hurts to double check with the manufacturer. On the paint can, it should state the recommended coverage rate. Remember, when applying light colors over a dark surface, you will need additional coats of paint, so estimate on the high side for your paint needs. When you consider all of these factors, it takes some of the mystery out of how much paint to buy. 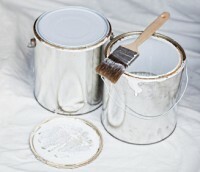 Gallon cans of paint are quite reasonably priced, so it’s always better to end up with an extra can of paint, than to run short and have your interior painting job look unprofessional. For average paint job on smooth walls I take the square foot of wall space (not square foot of the room) and divide by 350 (for one gallon coverage) then multiply that by 1.5 for a second coat. I ALWAYS apply two coats. ex: 432 square wall space divided by 350=1.23 (gallons) x 1.5 = 1.85 gallons. You can’t buy .85 gallons so you’ll round it up to two. —“You will need one gallon of primer or paint to cover 250 square feet of wall”— This is not always true. Primer covers less square footage than paint does. Especially when it comes to new drywall and masonry surfaces. Also, if your priming before you paint, I would suggest you have the paint store/desk tint the primer if possible. If you plan on choosing colors such as reds or yellow, expect to double your amount. If you are DIY you will be painting multiple coats! If you plan on using elastomeric paint, that’s more like 100 sf per gallon. Know what you’re buying, try your best to understand what colors cover and what do not. To the owner of this site…It’s always best to consult with an experience painter/paint store before consulting via blog or website. Your information, although partially correct, is misleading.